(Nanowerk News) Polymeric carbon nitrides are organic compounds synthesised to form a yellow powder of a myriad of nanocrystals. The crystalline structure resembles that of graphite because the carbon nitride groups are chemically bound only in layers, while just weak Van der Waals forces provide cohesion between these layers. It was already known that light is able to create an electron-hole pair in this class of materials. So there have already been numerous attempts to employ polymeric carbon nitrides as cost-effective photocatalysts for solar-powered water splitting. However, the efficiency levels so far have remained comparatively low. 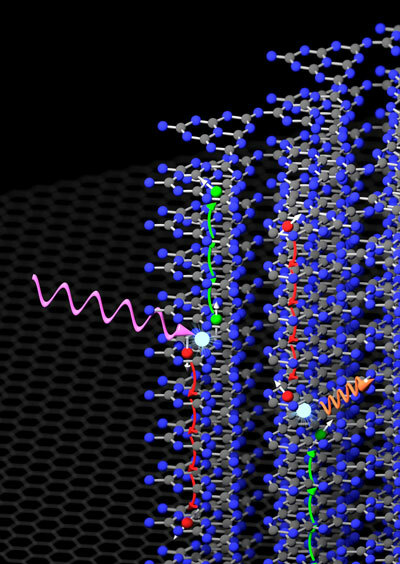 Now a team headed by Dr. Christoph Merschjann (HZB and Freie Universität Berlin) and Prof. Stefan Lochbrunner (University of Rostock) have for the first time precisely probed the processes occurring during light-induced charge separation ("Complementing Graphenes: 1D Interplanar Charge Transport in Polymeric Graphitic Carbon Nitrides"). "The most interesting result has been that charges are basically only transported along one dimension during this process, perpendicular to the graphite-like layers", explains Merschjann. The light creates an electron-hole pair that subsequently migrates in opposing directions. Using femtosecond spectroscopy as well as other spectroscopic time-domain methods, the researchers were able to make the first quantitative mobility and lifetime measurements on the charge carriers. This revealed that the charge mobility attains values similar to those in conventional organic semiconductor materials. Moreover, the charge carriers are long-lived before recombining again. Polymeric carbon nitrides are not only non-toxic and cost-effective, they are also extremely durable because they are chemically very stable and can withstand temperatures of up to about 500 °C. Components made of these kinds of compounds might therefore be employed in environments that are unsuitable for today's organic electronics. Merschjann finds the prospect of growing these compounds on ordered substrates, such as graphene for example, especially interesting though. This is because graphene possesses extremely high in-plane conductivity, while carbon nitrides primarily conduct perpendicular to the sheets. "Carbon nitrides need not fear the competition with conventional organic semiconductor materials. On the contrary, completely new kinds of all-organic optoelectronic components might be built using their property of being essentially one-dimensional semiconductors", Merschjann hopes. He is currently working on making direct measurements of the charge carriers in a DFG-funded research project at Freie Universität Berlin.